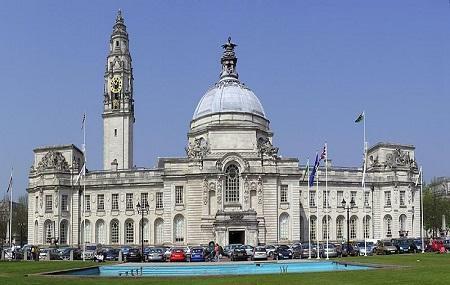 The Edwardian Baroque Architecture of Cardiff City Hall is the civic centre of Cardiff’s Local Government since 1906. The City hall is built of Portland Stone and its exterior features attract one’s attention. The 59-meter Clock Tower with a 12 feet gilded dial, the rectangular portico with the fountains and pool and the two memorials are notable. The fountains commemorate the coronation of Prince Charles as the Prince of Wales. The left memorial is dedicated to the fallen soldiers of the World War II and the right one is dedicated to the war victims. The interior Marble Hall of Cardiff City Hall is adorned with various statues. How popular is Cardiff City Hall? People normally club together City Hall Lawn and Cathay's Park while planning their visit to Cardiff City Hall. Big huge Imposing building with a huge dome and large clock tower. Backs onto Alexandra Gardens. Best place to take photos of the city hall are from inside Alexandra Gardens. Clock tower is over 200 feet high. Plenty of parking around Alexandra Gardens, pay and display, always get a place and good rates. From here a ten minute walk to Cardiff Castle. Nice helpful staff. These pictures are from the vegan festival outside of the town hall yesterday.